What wikipedia had to say about tuk tuk- "Auto rickshaws are a common public transportation in many countries in the world. Also known as a three-wheeler, tempo, tuk-tuk, trishaw, auto rickshaw, autorick, bajaj, rick, tricycle, mototaxi, baby taxi or lapa in popular parlance, an auto rickshaw is a usually three-wheeled cabin cycle for private use and as a vehicle for hire. 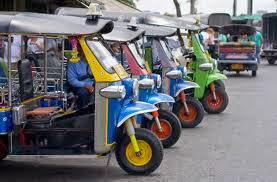 It is a motorized version of the traditional pulled rickshaw or cycle rickshaw." The tuk -tuk also varies from a mini lorry to just a horse carriage drawn by a motorcycle..
Then in Bangkok, the tuk tuk is different. It is like a mini capsule or truck with openings on the left and right. And then I was forced to take a tuk tuk in Surat Thani to my hotel and again to the airport. This one was actually a mini lorry. And the entrance was from the back.